I am Fireworks Zone webmaster and very interested by your website and particularly Fireworks commands. As a suggestion, we could work together on future commands. 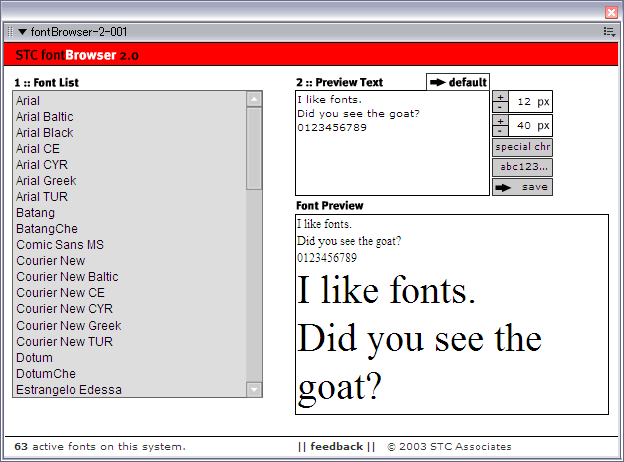 I downloaded Fontpane 2 and will write and publish a post about it. Do you know who created it? I subscribe Fireworks Zone and very glad to your comment. Fontpane 2 is maybe written by ANN that linked post. I want you to wait on a few day because it asks that. I wish to start english post for Fw commands on my blog. if you feel useful, then you inform Fireworks Zone in some methods without confirm. ANN say “zip and souce code is free what Modification, remodeling, and re-distribution on this post http://tech.ironhearts.com/blog/archives/102” . I looks forward to publishing the article.